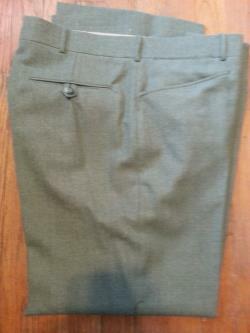 Bespoke 70s vintage fine wool jade colored dress pants with western pockets. As we went through our decades worth of fabric and clothes inventory we uncovered this amazing pants i created. This was made by myself and my wife in our new york city tailor shop back the 1970s. 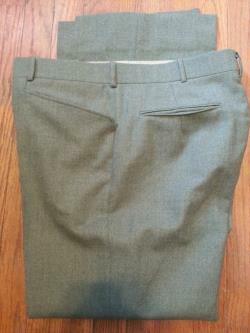 High waisted 37" and is expandable by 2" more. Inseam 27" and is expandable by 2" more. 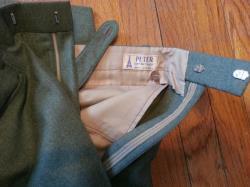 The 2 front pockets are of the western style (the opening is near vertical). There is also a hidden security pocket on the right side for cash, etc. The crotch are is reinforced with satin lining for extra durability and comfort.